Here's a look at sentiment on friday and again today. 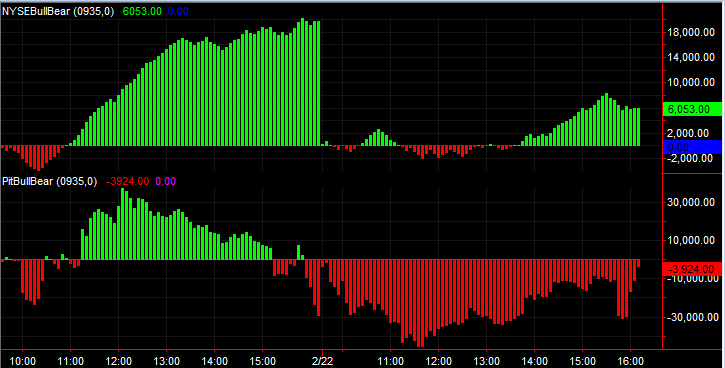 Note the extreme bearishness in the futures vs the cash today. Compare that to the bullishness from friday in both markets (Green in both, also NYSE sentiment was 20K vs todays's 6K). Friday the pit sentiment dropped off as traders took profits into rising prices, selling high. Although sentiment increased in the pit this PM, it dropped sharply into the close just after the NYSE sentiment began to decline. This is interesting...what is behind the scenes here? the calculations?